Ysgol Blaenau use their loaf! Brace’s Bread recently visited Ysgol Blaenau and had a day having fun with the children. 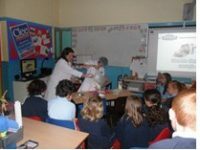 Dawn Mckee from Brace’s Bread spoke to the children of the whole school about how to make bread and history of bread and the Brace’s Company. Each child and staff were given a loaf of bread to take home at the end of the visit. They all agreed it was the best thing since sliced bread…!